The Sea Wasp remotely operated vehicle is designed to counter below-the-surface terrorism. Image courtesy of Saab AB. Sea Wasp ROV can operate at a maximum depth of 60m. Image courtesy of Saab AB. The vessel enables explosive ordnance disposal teams to find and destroy waterborne improvised explosive devices (IEDs). U.S. Navy photo by Mass Communication Specialist 2nd class Jared E. Walker. Sea Wasp is a remotely-operated vehicle (ROC) built by Saab to counter underwater improvised explosive devices (IEDs). It was designed based on the inputs from the US Underwater Hazardous Device Team. The Sea Wasp ROV was unveiled by Saab in May 2016 during the Navy League’s Sea-Air-Space Exposition. The ROV is a cost-effective and safe underwater solution for ordnance disposal. It can identify, relocate and neutralise IEDs placed in confined areas under water, ports and harbours. 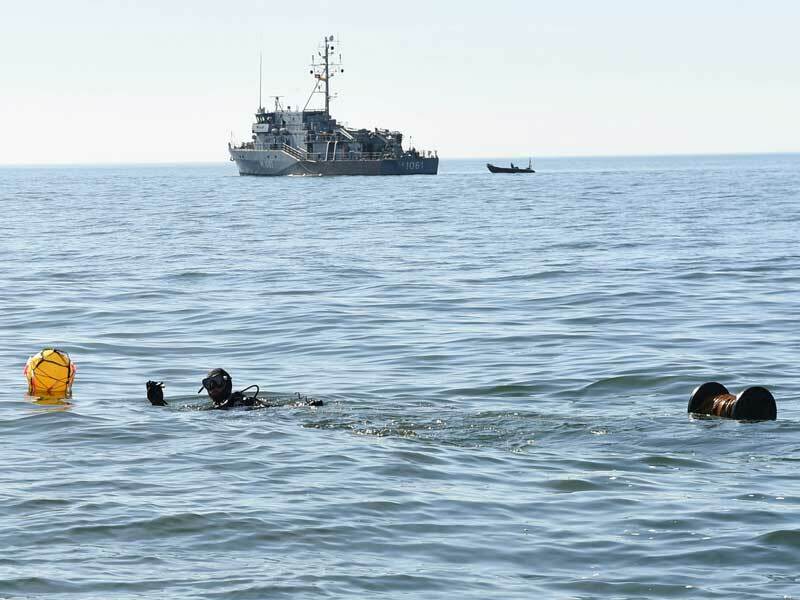 Saab, in collaboration with the Combating Terrorism Technical Support Office (CTTSO), delivered three Sea Wasp prototypes to the US Navy EOD Group 2, the FBI Counter-IED Unit, and Counter-Terrorist Operations Maritime Response Unit of the South Carolina Law Enforcement Division for training, testing and evaluation of the vehicles. The Sea Wasp ROV is based on the Saab Seaeye range of commercial ROVs. The modular design allows the vessel to be configured to meet mission-specific needs. The complete system is made up of a vehicle, generator, pilot station, hand winch and a power supply unit. The vehicle measures 1.7m-long, 0.5m-wide and 0.4m-high and weighs approximately 90kg. The ROV is attached with an ECA electrical five-function manipulator arm, which allows it to use a range of tools and methods to dispose IEDs and explosives. The arm with an attached camera is capable of positioning a disruptor near the target for detonation. The disruptor is then fired from the surface to neutralise the target, once the ROV is back to the launch platform. The Sea Wasp system accommodates a state-of-the-art sensor suite integrating a wide-band, multi-beam, forward looking sonar, along with LED lights and a colour pan tilt camera with 2X optical zoom. The ROV can be fitted with additional sensors depending on the mission requirements. Suitable payloads can be incorporated into the ROV during the mission planning stage to create a bespoke solution. The primary mission of the sensor suite is to locate potential targets in the area of operations. The operator then employs suitable tools and techniques to classify and dispose the target. The man-portable vehicle is operated by a team of two members and can be controlled by an operator console using a fibre optic tether cable. The control console of Sea Wasp can be positioned aboard a support vessel or a control vehicle onshore. The fibre optic cable also supplies power to the ROV subsystems. "The Sea Wasp ROV was unveiled by Saab in May 2016 during the Navy League’s Sea-Air-Space Exposition." The onboard Saab iCON2 intelligent control system provides six degrees of freedom for high manoeuvrability. The ROV is also equipped with auto depth, altitude, station keeping and obstacle avoidance capabilities. The doppler velocity log (DVL) and internal measurement unit (IMU) aboard the ROV create transmit specific way points for accurate way point navigation. The Sea Wasp counter-IED vehicle is propelled by six thrusters powered by brushless motors. The propulsion system provides a speed of up to 2.5kt and enables the ROV to safely manoeuvre during launch and recovery. The ROV has a maximum operating depth of 60m and can perform missions in harsh shallow water environments and tidal streams of harbours. The system can be carried over land in a light support vehicle and can be deployed from surface support vessels, vessels of opportunity (VOO), rigid-hulled inflatable boats (RHIBs) and work boats.